As previously mentioned, one of the limiting factors in our garden is the poor quality and shortage of soil. On the PDC (Permaculture Design Course) earlier this year I was introduced to Hugelkultur beds. At first I though that I wouldn’t be able to use them in my garden as the ones we introduced to were the ones that Sepp Holzer made on his mountainside farm in Austria.He did this using big machinery to dig trenches which he then filled with tree trunks and loads of woody matter, he then covered it back over with the subsoil and topsoil. 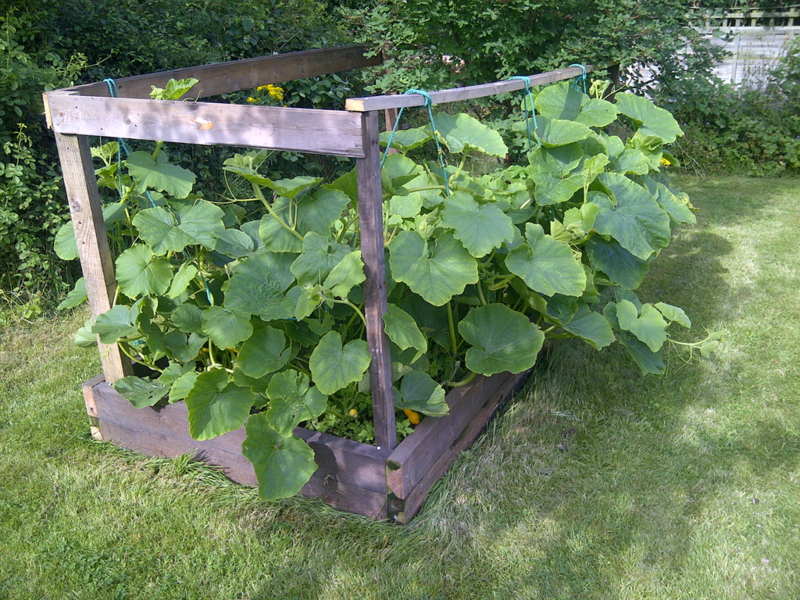 Here is a good article on hugelkultur raised beds. It wasn’t until we visited a few different sites on the course that I realised that I didn’t need to make the bed on the same scale as Sepp Holzer and so I decided to try a smaller version. I made a raised bed out of scrap timber about 1m by 2m and 30cm deep. I then dug out the turf and soil down to the cinder surface of the old tennis court (see last post for further details). Into the hole I put loads of hedge cuttings (hawthorn, privet, dog rose) plus a load of other woody cuttings from around the garden. I mixed in several bags of leaves that I was saving for the compost heap, two lots of grass cuttings from the garden and a load of partially rotted down compost. On top of this I put the inverted turves, and then the soil. The top of the heap at this point came up to my waist. 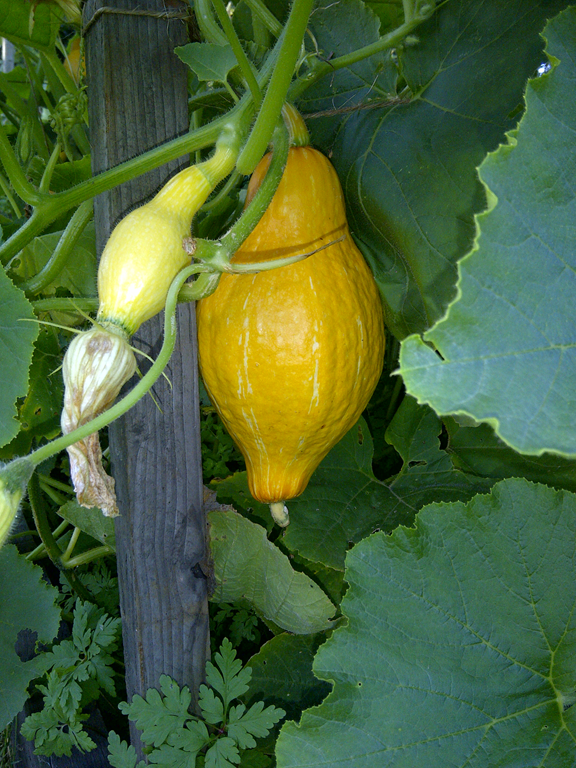 I immediately planted it up with red clover seed and some squashes and pumpkins that had been grown in pots. 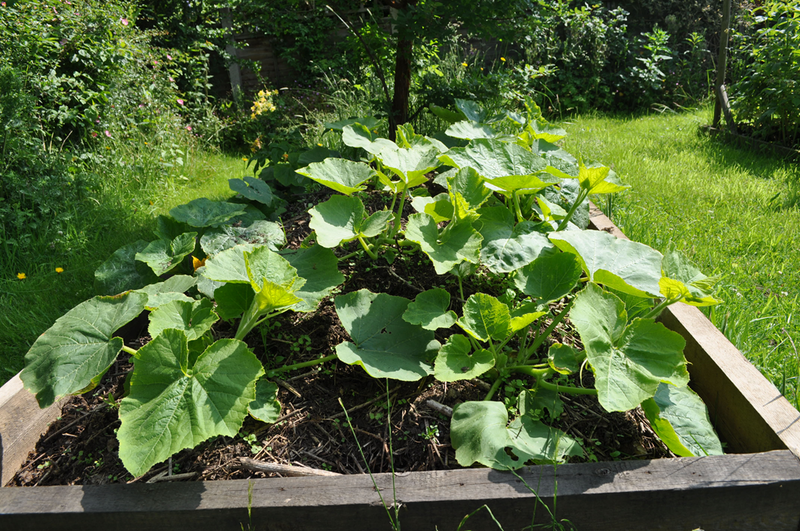 A few weeks later (12th June) and the soil had sunk down significantly but the pumpkins and squashes were doing really well though I do have to admit that I used some eco-friendly slug pellets. By pushing my hand into the bed I could tell that it was very moist and warm! A month and a bit later (21st July) and the plants were needing support so I knocked together a frame around them. As you can see from the photo the plants are doing very well! 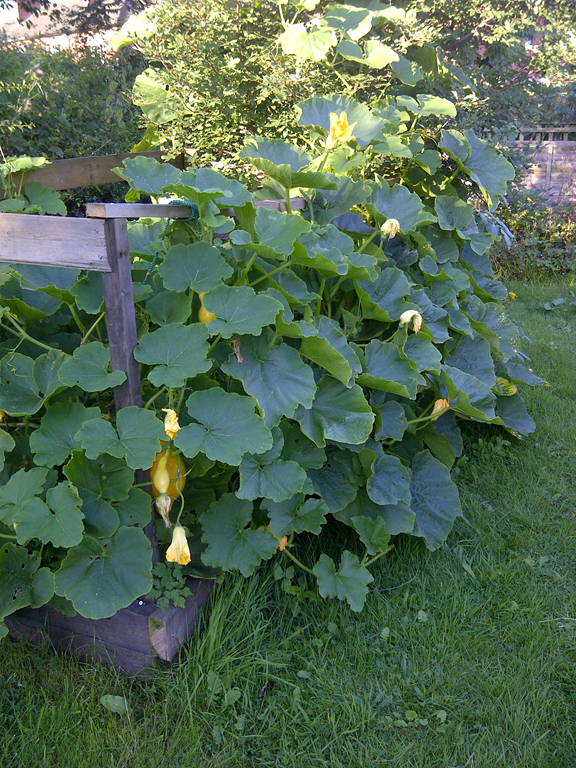 This is the bed on the 18th August, there has been loads of flower and lots of squashes developing. The bed is well overgrown and I haven’t watered the plants once. I look forward to having a good poke around in the soil at the end of the season to see what it is like, as well as eating the squashes! Certainly for this year this experiment looks like it has been a success. A patch of ground that was supporting only couch grass now has a good crop growing on it with minimal maintenance, it has coped with the bizarre weather we have been having without needing watering and hopefully has generated new soil for the garden. Not exactly a Hugelkultur bed of Sepp’s standard but, hey, size isn’t everything!